The methods of presenting and sharing visual media are in constant flux. Gone are the traditional slides and associated projectors; in are digital image files, computers, and LCD/DLP projectors. The need to follow such changing trends is particularly important in the field of Art History. 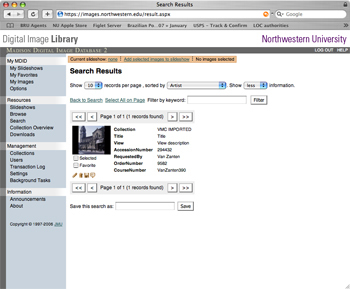 To bootstrap a transition to online image scholarship, the MMLC, the Department of Art History, and the Northwestern University Library collaborated in 2006 to launch the first version of the Digital Image Library. The repository was based on the Madison Digital Image Database (MDID) open-source software developed at James Madison University. Among its contributions to the project, the MMLC developed software to facilitate the import and synchronization of over 26,000 images and metadata from the University’s Voyager catalog system into the the MDID repository. The technology platform was ultimately transferred to the Library in 2008 and its time in service reached nearly seven years. Today, although Northwestern’s Digital Image Repository uses a newer software system developed by the NU Library based on Hydra and Fedora technology, many of the former design, workflow, and data synchronization principles remain intact.